Many men suffering with BPH don’t even realize they have an enlarged prostate. If you’ve begun experiencing the above symptoms, the best course of action is to visit a qualified urologist for a diagnosis. After you schedule your visit you can take the BPH Symptom Score Index online, provided by the American Urological Association, and share the results with your urologist. Your doctor will take your personal and family medical history, asking you a series of questions to narrow down the cause of your symptoms. After that, your doctor can begin basic diagnostic testing, including a urinalysis and a digital rectal exam to check the size of your prostate. Some patients will also need to undergo a urinary cytology to screen the bladder for cancer. 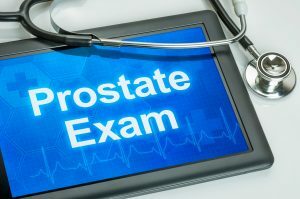 From there a blood test may or may not be needed to measure the level of prostate-specific antigen (PSA) in the blood, and a uroflowmetry test can also be performed as well as a cystoscopy. The qualified, professional, board-certified physicians at Georgia Urology specialize in diagnosing BPH and will make the process as brief and comfortable as possible. We are the largest urology practice not only in Atlanta, Georgia but also in the entire Southeast. Our 43 urologists practice in 30 offices and ambulatory surgery centers throughout the Atlanta metro area and only use state-of-the-art equipment and advanced treatment techniques. There are ways to manage and treat the symptoms of BPH, and Georgia Urology can help. Schedule an appointment today. 1McVary K: BPH: Epidemiology and Comorbidities. Am J Manag Care 12 2006; 5 Suppl: S122. 2Carter HB. Prostate Disorders: The Johns Hopkins White Papers. Baltimore, MD: Johns Hopkins Medicine; 2010:1-24.